The most recent and technologically advanced version of the Siege Tortoise. The –H model maintains the speed and maneuverability of the –B series, but is equipped with superior targeting systems and an upgraded communications suite. To prevent its high-tech weapon system from falling into enemy hands, the XZ-204-B is equipped with internal explosives that enable the crew to completely destroy it. The kingdom of Gershai is barely 500 square kilometers in size, yet it is heavily urbanized with a technical and industrial infrastructure. Spurred on by the rise in feral Zoid incidents and seeing the resurgence of the Zenevas-Helic conflict about them, the king knew that his small country would need to defend its resources from the giant nations about them. Long had the region relied on the large tortoise Zoids native to the region, mostly as heavy equipment and labor saving machines, with a core of less than 50 used for military defense. As violence seemed imminent about Gershai, facilities moved to ready more tortoises to counter the diverse units wielded by other nations. Limited in funds but less so in resources, Gershai set about creating a number of modular shell unit configurations that could be utilized by a universally identical Zoid chassis. To maintain Gershai’s political position of neutrality, the new military Zoid was dubbed “Siege Tortoise”, intended to defend the nation to the point that an enemy would be required to siege the unbreakable defense. Every sub-class of Siege Tortoise relies on two standard forms of defense; armor and shields. 20cm of interlaced, layered, composite armor makes it one tough nut to crack. This armor is even heavier on some versions, depending on their combat roles. Gershai shielding technology is limited, but it is strong enough to help divert lighter artillery and heavier shrapnel from achieving direct impacts against the armor. While there is room within the shell for a Siege Tortoise to mount ECM pods, its form does not readily lend itself to such defenses. Rather, these units are all equipped with chaff, smoke, and other canister-deployable countermeasures. The main pods are located on the sides of the turret and are heavily armored. Each pod has two countermeasure ejection tubes that may also be loaded with anti-troop grenades. The ports may be opened from within so troops inside the Tortoise may fire through the ports with small arms in the same fashion as security guards within an armored car. 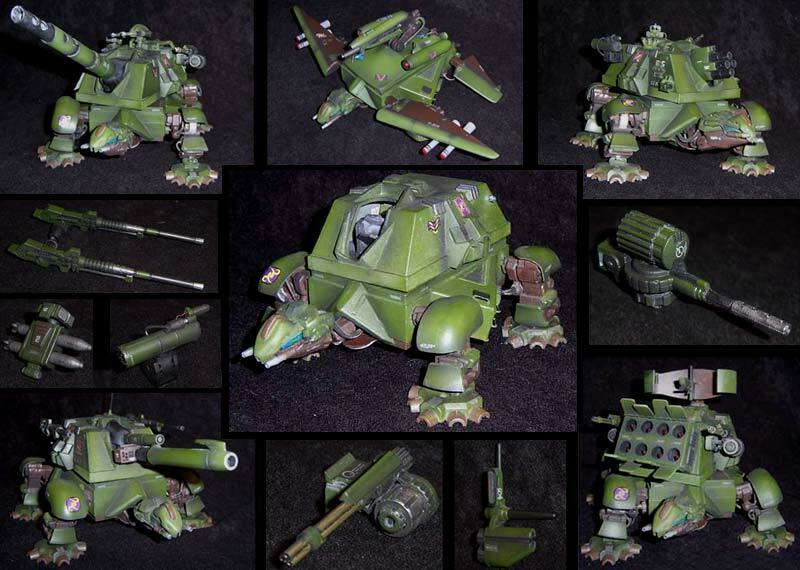 While each configuration of Siege Tortoise varies in mission role and therefore capability, all are based on a common chassis. The variants will be covered each in turn, but the core unit has capabilities of its own, described here. 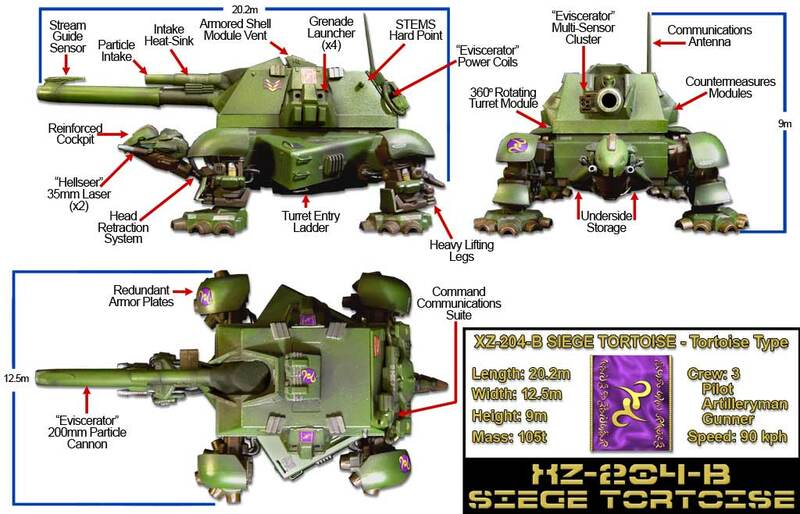 At the heart of every Siege Tortoise variant is the XZ-204 itself. This chassis can attain speeds of 100 KPH across most terrain, and the wide, low stance is incredibly strong and stable. The units can traverse underwater to a depth of 100 meters, and can remain submerged for up to 1 hour. In addition to attack and defense power, the XZ-204 chassis also maintains the tertiary role of armored military transport, capable of pulling Gustav trailers and up to 400 tons of cargo. 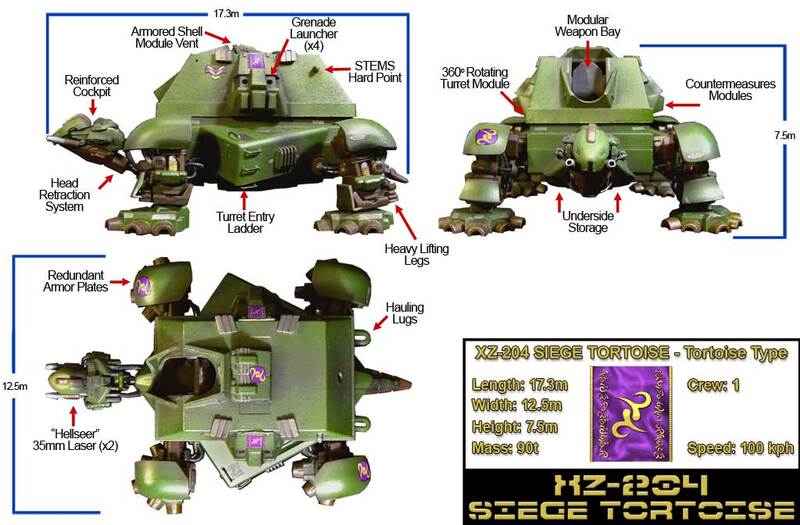 Each Siege Tortoise variant is defined, primarily, by its armament. Each features weapons that are standard on the chassis, then various modular “shells” are secured atop the chassis to define the role the Tortoise will play. The following outlines are organized to reflect the varients’ armaments. Duplicate systems are noted but only described in detail upon their initial inclusion to the descriptions. These light weapons are mounted on the “helm” of the Siege Tortoise. They are limited in damage capability and are used primarily against light Zoids, vehicles or infantry. They are rapid cooling, however, and can be used for extended durations. The guns were included in the Tortoise’s design to afford it firepower in the forward arc should the turret be targeting elsewhere or disabled. To ease the loading times for this graphics-intensive page (and for my poor site builder), I have created an entirely new page for those who would like to follow along the history of the construction of the Siege Tortoise (and turtle!) Please feel free to click and continue your journey through my bent brain. The XZ-204 shell module is equipped with hard points, one on each side, and some configurations add a dorsal point atop the roof. The following systems are designed for the Siege Tortoise to mount them as secondary or even tertiary systems to the primary battery. Each of the variant descriptions will describe those external pods which are most often paired with the primary weapon system, though these are chosen at the commander’s discretion. All pods maintain a 360º horizontal arc due to being turret mounted and 200º of vertical rotation (some are capable of a full 360º of rotation as well). This self contained, self-powered, three-barrel Gatling cannon has a conservative 100 rounds per second rate of fire but uses heavy 35mm APEX rounds. It is primarily intended for defensive use, either from incoming projectiles or against light Zoids and armor, sometimes infantry. With a drum containing only 800 rounds, the Trinity is often used in burst mode, sending a hail of 30 bullets into a target in a one second burst. The gun is often coupled with the “Farsight” close-in targeting system which has an excellent reputation for accurately targeting incoming missiles. The Trinity also as a “semi-automatic” firing mode that slows the gun to 5 round per second when conserving ammunition is a requirement, or for when soft armor and infantry targets present themselves. Two configurations of Trinity exist depending on if the gun is mounted on the left or right side. One of each can be placed on a dual-system mount and can be used as a paired weapon. A standard external missile box with integrated targeting system and FAF (fire-and-forget) electronics package, the Twin offers a heavy punch as well as anti-aircraft solution. Each missile is laser and core-sensor guided with a range of 50 kilometers. The shape-charged warhead can penetrate standard Zoid armor with ease and can readily disable even heavier units. Additionally, the warhead can proximity detonate to shred light armor and infantry units, as well as severely damage aerial units. Once both missiles have been launched the pod may be either reloaded in the field or jettisoned, opening the hard point for another module. The Dire Wolf is a licensed, slightly modified version of the weapon system mounted on the standard Command Wolf used extensively by the Kingdom of Helic and also the Zenevas Empire. It is the only STEMS component adapted to draw power through the hard point socket as opposed to being completely self-powered. 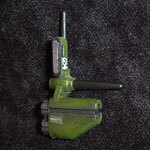 The gun is fixed to a servo-mount that allows a broad range of inclination and elevation. This weapon has a limited range of only 2 kilometers, but it allows for some significant damage and maintains a respectable rate of fire; 1 shot every 5 seconds. Designed to offer a Tortoise variant a projectile weapon in order to defeat shields and moderate armor, the Vendetta uses hypervelocity, armor piercing rounds to perforate targets. It has the armor penetration power of a 75mm gun by omitting an explosive core within each round; rather, it uses its own shrapnel to cause more internal damage once armor is bypassed by a carbon fiber, micro-serrated penetrator. The Vendetta fires 1.5 rounds per second from a 300 round capacity drum and has an effective range of 2 kilometers against standard targets. Against light armor and infantry, the gun extends its effective range to almost 4 kilometers. A common, lightly armored sensor and tracking array, the Farsight is most often paired with the Trinity Gatling cannon as a point defense weapon or to enhance the warhead targeting and guidance capabilities of the XZ-204-M variant. 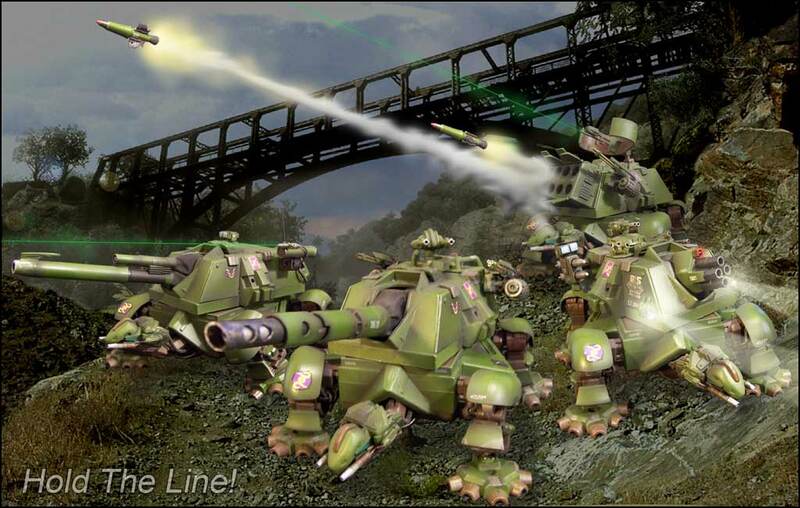 The newer Farsight system includes “Far Reach” hardware and software that allows other allied units to target through the system, providing indirect fire capability to the armored division equipped with the Farsight. 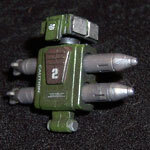 On the XZ-204-M, or missile platform variant of the Siege Tortoise, the Firehawk tactical missiles may also link directly through the nearest Farsight system and use the data to self-guide to the target. The Vortex is a standard MFR pod used by many armed forces to bolster their light vehicle firepower. The hypervelocity rockets have armor penetrators that ram home a high-explosive laced rod of hardened steel that shatters within the punctured armor. The rockets are semi-guided and are considered accurate up to 1 kilometer away, having only a 50% hit ratio beyond 2 kilometers, but they are very difficult to shoot down. Rockets may be fired singly or all 19 can be loosed in under 2 seconds. The Siege Tortoise may be from a secondary power nation, but the chassis was built on a well evolved Zoid. As such, its Artificial Instinct And Intelligence (AI-2) profile is also quite well developed. The Tortoise is emotionally very stable, almost impossible to panic to the point of standing in defiance even as it is torn apart by a Geno Saurer or other such predatory Zoid. It, itself, is slower to react to situations, and therefore relies heavily on its crew to utilize its offensive and defensive weaponry. The XZ-204-B carries the standard armor and defense system package as the XZ-204. The XZ-204-B is considered the standard field unit by Gershai commanders. Its “-B” designation is due to its beam artillery cannon, which all but assures it must remain in a line-of-sight situation to be effective. It is designed to operate in the open field and in rough terrain. The –B uses the standard Siege Tortoise chassis and suspension systems, but the weight of its weapon and support systems reduces the speed to 90 KPH. A menacing weapon that essentially fires a pulse of loose particles into the target at near light speed, then snaps a powerful discharge of energy through the cloud. The particles cause heavy kinetic damage, much like a huge, light-speed sand blaster, and then that wound is essentially struck with a powerful bolt of lightning. The energy pulse is hot enough to instantly melt up to 30cm of hardened metal armor and has the added benefit of shorting out vulnerable components. The Eviscerator requires a recharge and cooling time of almost 15 seconds, making more useful as support artillery as opposed to a front line weapon. Further, despite the size of the gun, its range is limited to just beyond 2 kilometers for full effect, though the particle spray can still cause substantial damage at up to 5 kilometers. The XZ-204-B is usually armed with a pair of Dire Wolf 50mm extended range laser cannons. These afford the Zoid an effective rage of 2 kilometers with enough firepower to threaten even larger enemies. The power plant of the –B provides ample energy for the guns while the main battery cools and charges, and the lack of ammunition allows the Tortoise to remain in the field for extended durations. Secondarily the XZ-2004-B is armed with the Twin Torrent missile pod and the 50mm Vendetta. These weapons offer the –B both a long range and a short range shield-defeating projectile option. The XZ-204-H has identical armor and canister-countermeasure systems as the standard chassis and –B variants, but the nature of its power system afford it 30% greater shield strength. Further, the very nature of its primary armament grants it a greatly reduced or “slippery” sensor signature; almost as if it were packing extra ECM equipment. This advanced weapon was designed specifically to counter the defenses of the EZ-501 Fusillade; no easy task. It combines the range, penetration and kinetic damage potential of a 140mm solid projectile with the benefits of a superheated plasma weapon. The shell is fired from a 140mm cannon that is mounted within a 300mm plasma launcher in such a way that the plasma encapsulates the projectile. The charged plasma has two potent effects; 1) it confuses sensor systems as to the nature of the projectile and 2) it causes considerable heat-based damage on impact. Charged plasma, in this form, fools an active defense system into seeing an energy bolt; a weapon not targeted by defense missiles or Gatling cannons as firing into an energy ball is seldom effective. The nature of superheated plasma also limits the projectile to being almost solid with a dense penetrator and a minimal explosive charge. The heat of the plasma field reduces the round’s effectiveness by half at its maximum range of 50 kilometers because it has softened and boiled the casing away. Beyond 30 kilometers the weapon becomes ever quite inaccurate. With some 300 rounds of ammunition, the Tortoise can afford to miss a few shots. The power plant aboard the XZ-204-B is used to charge this weapon while the Eviserator cools. 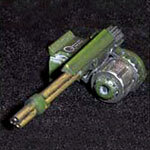 It is a small, auxiliary turret mounted atop the Tortoise’s primary turret; a double-barreled laser cannon intended for use as a backup system. Though compact, the weapon is powerful enough to give pause to units even exceeding 50 tons. Being such a valuable unit, the XZ-204-H is usually armed with the 30mm Trinity Gatling cannon and corresponding Farsight system to greater ensure its survivability. It may, however, be mounted with Vendettas or Dire Wolf cannons if it is expected to close with an enemy force, affording it greater firepower within close to medium ranges. As the heaviest variant of the Siege Tortoise, the XZ-204-M has had its suspension and drive systems upgraded to handle the load. As with the other versions of the XZ-204, the most dramatic changes lie within the turret module. The –M has the most powerful and accurate targeting and communications system of all the Tortoise variants. The STI-M8 "Hawkeye" tracking system is able to sweep 100 kilometers and track more than 40 targets simultaneously. This aspect often lends it to being chosen as a field command unit in addition to a bombardment platform. The XZ-204-M chassis has standard armor and light shielding systems. The turret has the standard armor and defense modules on the lateral surfaces, but the rear armor is weaker due to the ventilation requirements of the targeting system and missile battery. The forward armor is also standard, but pushed forward some 3 meters to make room for the missile bays. Within the turret, between the battery and the turret mechanics room, is now a reinforced armored firewall. Effectively, this places 3 armored walls between the Silo Operator and a frontal attack. 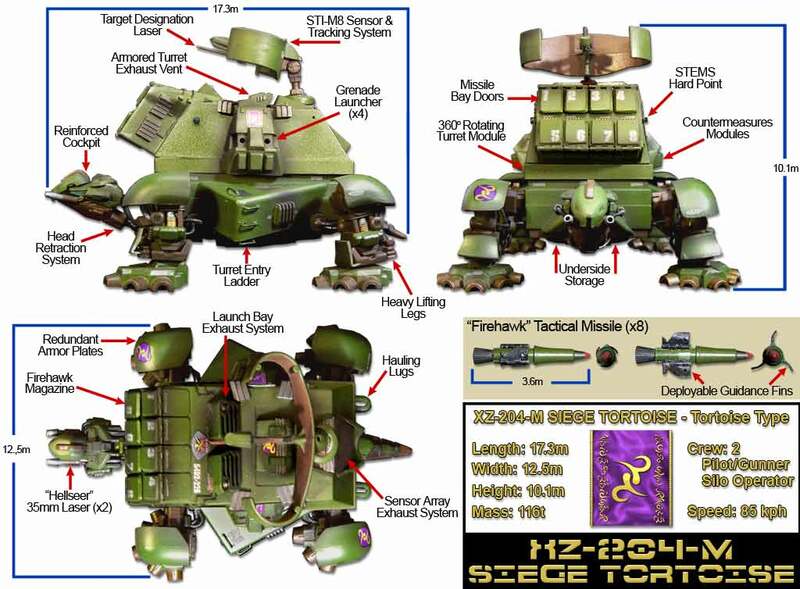 The most radical land variant of the Siege Tortoise is the XZ-204-M; a walking missile battery. The turret houses eight five-meter long “Firehawk” tactical cruise missiles within armored bays. Each missile can deliver a high explosive warhead up to 200 kilometers away with excellent accuracy. While the missiles are best used against ground targets, they are agile enough to hunt down and strike less agile aerial targets traveling up to MACH 4. The STI-M8Hawkeye tracking suite which accompanies the battery is capable of tracking all 8 missiles while tracking 40 incoming targets simultaneously. The XZ-204-M can link its STEMS to the STI-M8 Hawkeye system for targeting. Due to this feature, it is common for the –M to mount either a single or a pair of 30mm Trinity Gatling cannons as an anti-missile defense and for use against soft targets. Some commanders prefer a single Trinity and a 50mm Vendetta for backup firepower, but one Field Major has made it popular to mount a pair of Dire Wolf 50mm laser cannons to his –M units. The XZ-204-U, or Urban variant, is designed to be compact and mobile for fighting in a city environment. 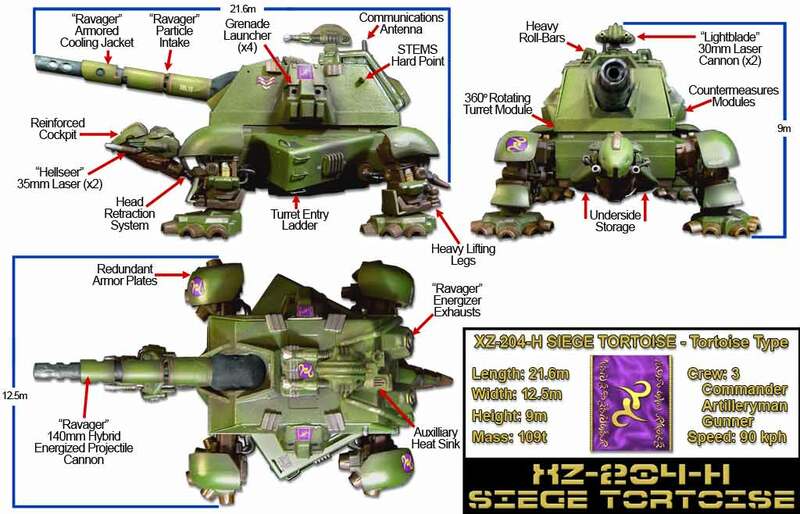 Of all the variants of the Siege Tortoise the –U is the most similar to the core chassis in capability. The weight of its weapon systems does reduce its speed to 95 KPH, but modifications to its legs and suspension grant it slightly higher agility than other units. On of the most significant features of the –U is that it is designed to double as an armored troop transport and can carry and deploy up to 12 soldiers and their gear within the turret. The Urban Siege Tortoise features armor 10% heavier than the other variants but its more compact weapon systems and troop carrying spaces reduce overall weight. 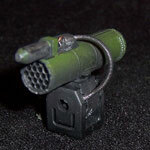 To aid in the deployment of troops, this version also mounts additional smoke canister launchers atop the main turret. 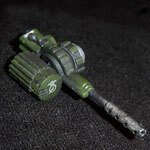 “Hammer” units are usually armed with the 30mm Trinity Gatling cannon and corresponding Farsight system to give it both defense against short range missiles and for use against softer, more agile targets. “Spitfire” sub-variants often carry Vendetta 50mm cannon to engage local targets and the Twin Torrent missile system or Vortex MFR for a heavier punch. There are actually two sub-variants of the XZ-204-U. The “Hammer” is designed as a close-quarters anti-armor tank; the “Spitfire” is prioritized as a defense platform. The PC150-9 is a standard howitzer used to support Gershai field troops; compact and magazine fed. The urban Siege Tortoise variant mounts four of these guns within a heavy brace framework that stabilizes them and absorbs recoil. The mounted version of the gun has barrels shortened to the very minimum required to maintain any accuracy within 2 kilometers, and still deliver heavy damage. The truncated weapons also allow the Siege Tortoise to maneuver in tight quarters were long barreled weapons would pose an obstruction. Each gun can fire independently and is fed with a separate magazine with 60 rounds of ammunition. An innovation of Rhoar Weapon Works, the CPC30 is a modular Gatling designed specifically for the XZ-204-U Siege Tortoise. The weapon can replace any of the four Hammer howitzers to give the Tortoise an added edge against light armor and infantry. The gun has a 3,000 round ammo drum and can empty it in 50 seconds; it is usually used to fire 50-round bursts. A special variant of the Tortoise is the XZ-204-UD, for “Urban Defense”. This sub-variant replaces all four howitzers with Spitfires and mounts target tracking systems on the turret hard points in order to shoot down projectiles mid-air, whether they target the Tortoise or not. The DK-75MGS mounts a pair of cable-fed 55mm guns in a highly agile turret. This weapon is mounted over the infantry exit door at the rear of the XZ-204-U. It is used to afford cover to infantry units, but also to give the –U a fast responding turret to engage targets down multiple streets simultaneously. Each gun is powered by an independent generator coiled around the turret mechanics. Firing in 1-second bursts of 4 rounds, the DK-75MGS can supply stopping power against even well armored foes. Designed to provide the –U with a selection of anti-infantry and light armor defense options, the Dark Rain system is comprised of six breech-fed mortars set in two three-tube arrays. Crews may opt for a number of rounds to be loaded from within the turret magazines; smoke, concussion, fragmentary, chaff, and daylight flares. Typically the –U is loaded with 60 round of each type, 10 per barrel, for a full load of 300 50mm mortar rounds. The XZ-204-A has been modified to the point of almost requiring an entirely new designation. An aquatic variant of the Siege Tortoise, the –A maintains the same chassis but replaces not only the entire dorsal shell module but the legs as well. The turret has been replaced with a low profile, hydrodynamic shell. Likewise, the legs have been replaced with hydroplaning fins. The armored hull has been reworked to allow dives up to 200 meters. It has also had its ground based communications suite replaced with an aquatic array, and in addition to the standard Siege Tortoise sensors and scanners the –A carries full sonar capability. The –A planes underwater with four core exhaust engines; two powerful drive engines beneath the front fins and two less powerful maneuvering engines beneath the rear fins. The form allows a top speed of 40 knots while submerged. On the surface the Tortoise uses its fin tips to hydrofoil, and the wings also create a surface effect that bring it a top speed of 120 knots, though with limited maneuverability. 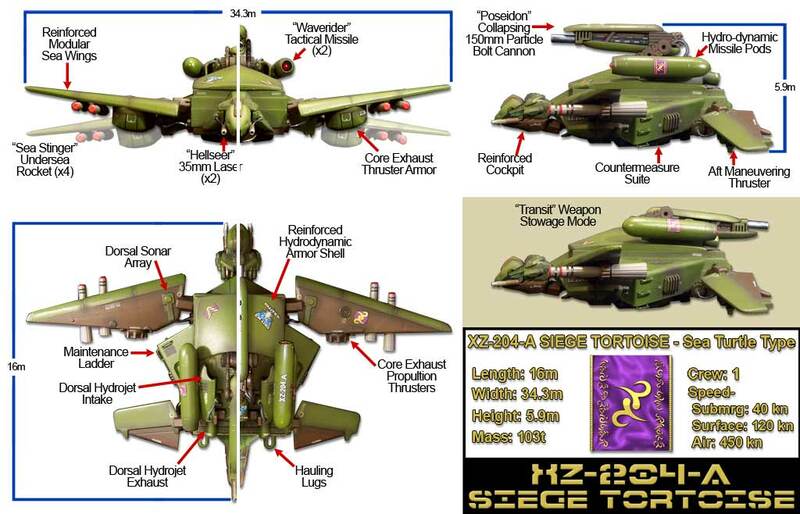 Surprisingly, the Siege Tortoise –A can vent full thrusters and use surface effects to fly just over the surface of water or solid ground. In this mode it can attain speeds up to 450 knots, but only for short durations and almost only in a straight line. For all of its advanced changes and agility, the –A is limited in its performance by having only one crewmember; the pilot must both maneuver the Zoid and act as gunner for its weapon systems. The lower profile of the XZ-204-A increases the difficulty of targeting it. This couples with the greatest speed and maneuverability of any Siege Tortoise also gives it one of the highest survivability ratings in the arsenal. The chaff and smoke dispensers carried by its land dwelling kin have been replaced with a selection of sonar and sea-sensor defeating countermeasures that are ejected from beneath the lower hull. Unique from the land-based XZ-204 series, the –A is not designed to make use of STEMS. As can be expected, the –A variant is armed with weapons befitting its marine environment. 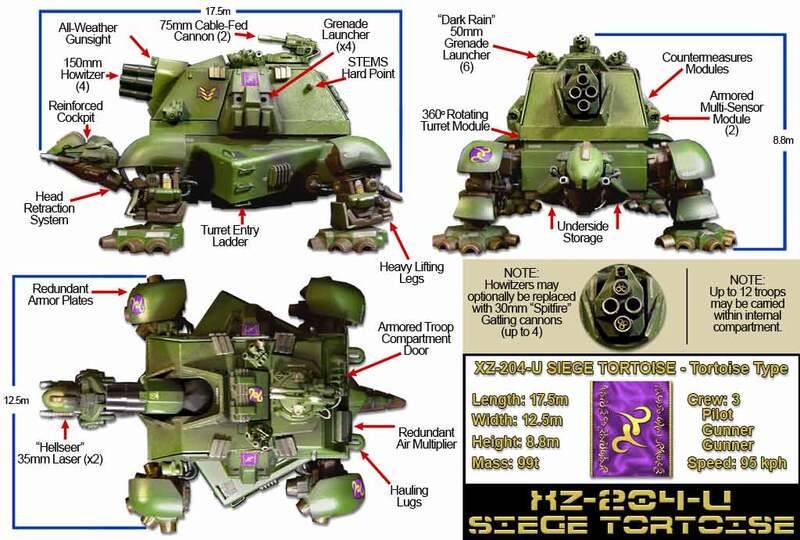 Certainly it is the only Siege Tortoise that carries "torpedoes" (in reality, undersea rockets), but it is also equipped with artillery to offer support to inland allies. The heavy direct fire weapon integrated into the chassis of the XZ-204-A is the Poseidon; a particle cannon that fires a compressed burst of accelerated particles. It causes heavy damage to targets within three kilometers outside of the water, and within 500 meters while submerged. The system is stowed in the aft-facing position and can rotate around rotate 200º to engage a target. Its ability to raise on its telescopic armature and use of a top-mounted targeting system allows the pilot to remain submerged and fire at land or avian target. Mounted to each dorsal engine of the –A is a launch tube for a Waverider tactical missile. 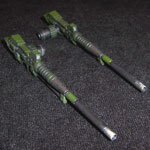 These are medium tactical weapons that may be launched from above or below the waves and target anything the Tortoise can lock on to; land, air, surface or submerged. 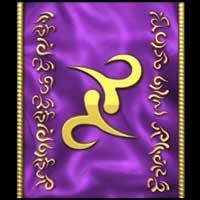 They have a range of 20 kilometers and can deliver heavy damage. The launch pods rotate 180º and face aft when the XZ-204-A is in transit or must rely on speed or agility, then re-face forward to launch their payloads. For more local encounters, the XZ-204-A carries four Sea Stingers; hypervelocity rockets that function as super-fast torpedoes. These only have a range of 1 kilometer and carry a low yield warhead, but their speed offers them a high armor piercing ability. The kingdom of Gershai does not rely entirely upon the XZ-204 platform, but the success of the line is undeniable. A typical armored division is usually comprised of one of each land-based variant. In the end the investment in the modular XZ-204 Siege Tortoise has presented itself as a gamble that has worked well. The variants offer rapid adaptations to the nation’s defense/attack capacities, keep maintenance concerns to a minimum, and have proven an effective deterrent to the more powerful nations around Gershai. The addition of STEMS make the system even more versatile. The effectiveness of the Seige Tortoise design has caused the other nations to pause and take notice of the advantages to modular Zoid design and customization.